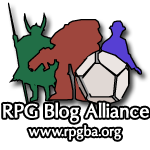 Today marks the end of an era in gaming blogs, the RPGBA has ceased operations. It wasn’t long ago that I joined and I posted this article last year about it. I shall certainly miss the benefits it offered which was the traffic it generated for the blog, the rss feed and the sense of a wider community. Scot Newbury of of Dice and Dragons has picked up the mantle with the rss feed and a Google+ group so see you at Google+ . This months carnival host is the Dice Monkey and they want to talk about the blogging community; something I’m proud of. I started an attempt at blogging a little over five years ago with an abortive blog on the blogger platform to chart our progress through the Complete Masks of Nyarlathotep campaign and for one reason or another my blog never materialised. Then I sort of fell out of favour with writing, I guess I got a bit disillusioned with it. Fast forward a few years and the creative urge hit me again so I revived the idea of a gaming blog and decided to write once again. Thats when I realised that once I had written something I needed an audience, someone to read my writing and I looked at ways I could publicise it. The web had moved on from the early days of webrings and free hosting but networks were becoming popular and I could see that once you had joined a network you could become a part of that community. The RPGBA was the first network I applied to and I’m glad they took me aboard. Not only did I like the fact that I was part of something bigger than myself, the blog carnival meant I could collaborate with other network members on similar topics, like this one. Back in May I hosted my first carnival article about Star Wars. It seems that I got more traffic via the network than I do through search engines and that makes me somewhat happier. So if you like this article, please comment on it and let me know what you think. This months carnival is being hosted by Mind Weave Role-Playing Platform and they want to know about dungeons. In all my years of gaming the groups I have played in haven’t really done much in the way of dungeon crawling, our fantasy adventures tend to be wilderness or urban themed with the usual mixture of combat, problem solving, barge burning and diplomacy. That’s not to say we haven’t done them, they’re just a rarity. The one dungeon that I do love more than all the others is the first one I ever ran in module B1: In Search of the Unknown; the Caverns of Quasqueton . The great thing about the dungeon is that is had advice for a novice DM as well as letting you stock it yourself from the charts and tables in the back of the book. These charts had treasures; both magical and mundane plus monsters appropriate to the level of the characters. This ensured that although the general layout remained the same, you could never be sure what lurked in the next room. On top of this there are several unexplained events so that the dungeon retains a magical quantity. I found it the ideal starter dungeon and this is why I will come back to it time and again for the nostalgia and the happy memories of me running it.